Since the start of September, cooking enthusiasts – from novice to aspiring gourmet chef - have had at their disposal the completely revolutionised cooking service of Uwielbiam.pl. This virtual platform has something for everyone, with thousands of recipes and advice for all levels, all showcased in an innovative tool that has started to make its mark on the market. MakoLab is responsible for the ‘Mise en Place’, through developing and implementing the new graphic design concept. Transforming Uwielbiam has been an ongoing project since the start of 2017. Preceding our proposed graphic design concept, a process of collaborative work was undertaken in analysing the functioning of the service, observing and understanding consumer behaviour and how users navigated the service, as well as an assessment of the attractiveness of the content and the way of presenting the recipes. 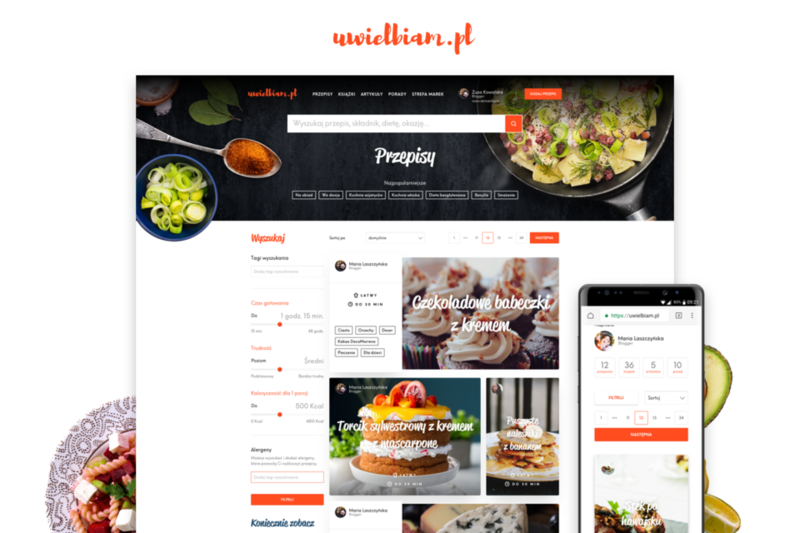 Uwielbiam.pl is a service where recipes for every occasion are created by both professionals and everyday users. One of the main goals of the project was to illuminate the versatility of Maspex's FOOD brand in their application as great ingredient choices. Through this platform it can now be shown how Maspex products really ‘cut the mustard’ for fashioning a whole range of delicious and attractive dishes, and how vitally important DecoMorreno chocolate is when deciding on your dessert options. Here users can find inspirations and ready ideas on how to combine the products available in each store and how to create both classic dishes, as well as unexpected and surprising flavours. We wanted to create a comfortable and modern platform where people who want to start or continue their cooking adventure will be able to find recipes and tips in an intuitive manner, tailored to their needs and preferences. MakoLab's team systematically refined the service, further developing the navigation and modern UX concept to showcase with the latest digital trends. In order to fulfil the key task given by the platform’s creators of delivering precise content to its users, a deep analysis of the site was undertaken to understand the multitude of ways in which the site was being used. The key to fulfilling customer intent was the dynamic, real-time matching of the content of the site to the needs of its users, which was achieved through developing advanced personalization and detailed consumer scenarios. The newly launched site is based on the Sitecore platform. We are very happy that Maspex trusted our recommendation and has since rated it highly, considering the benefits the platform brings for content management and guiding the "customer journey". “The Sitecore Experience Platform is very technologically sophisticated at creating user relationships and providing them with exactly the content they are looking for. We are at the beginning of the road in build a culinary community around Uwielbiam.pl and the brands' potential, given the FOOD portfolio of Maspex, is enormous.